At the southern end of the Uinkaret Plateau (southern part of the Grand Canyon - Parashant National Monument) is a large basalt-capped mesa named Mount Trumbull. The 7,880-acre Mount Trumbull Wilderness encloses most of the mountain. The location is just north of the Mount Logan Wilderness Area and the Grand Canyon. The south and west slopes of the mesa are steep with manzanita, pinon, juniper, cliff rose, shrub live oak and silktassel growing everywhere they can get a root into the ground. The top of the plateau (about 8,000') is covered with a virgin forest of Ponderosa pine, while the less steep areas at the foot of the mesa have nice stands of aspen interspersed with Gambel oak. You'll find Kaibab squirrels, mule deer, bobcats, mountain lions, coyotes, skunks, porcupines, wild turkeys, owls and hawks all through the area. You'll also find plenty of western diamondback rattlesnakes. Near the base of the mountain at Nixon Spring you'll find a BLM campground with drinking water and a trail that leads to the top of the mesa (5 mile round trip but bring your compass and a map: the closer you get to the top, the more the trail fades). Access to the area is via SR 389 from Fredonia to Mohave County Roads 109 & 5 (the Mount Trumbull Road). From St. George, Utah, youy can take the Quail Hill Road (BLM Road 1069) to Mohave County Road 5 to Mount Trumbull. 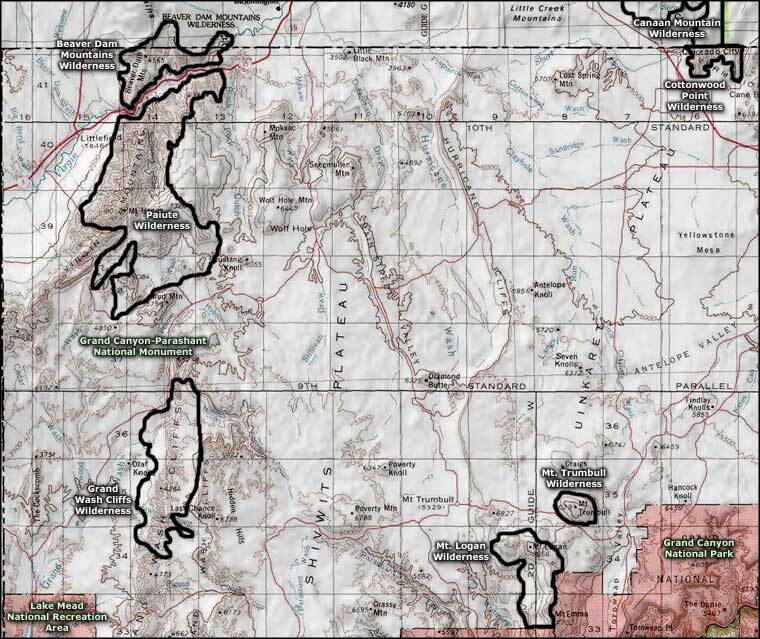 But save yourself some trouble: get the Arizona Strip District Visitor Map which shows the roads and wilderness areas in detail. Photo of Mount Trumbull Wilderness courtesy of Wikipedia userid Tainter. Maps courtesy of National Geographic Topo!